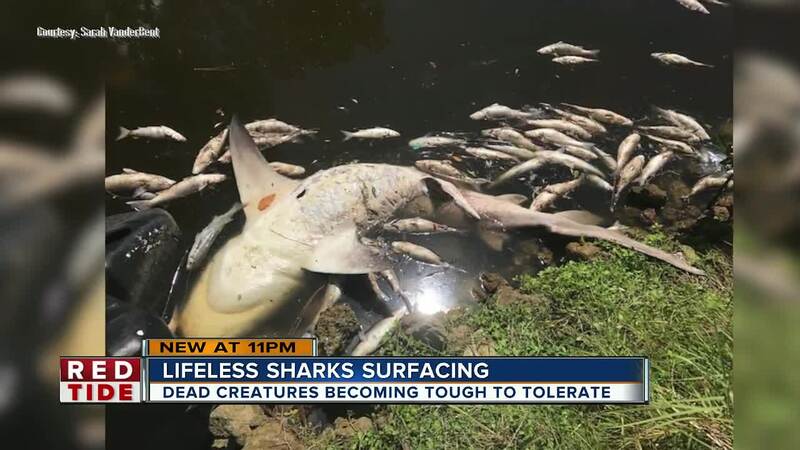 BRADENTON, Fla. — Homeowners contacted state wildlife officials after they found a dead shark mixed in with thousands of dead fish in their backyard creek. Sarah VanderBent said she noticed the decomposing shark on Thursday morning. "It was a pretty big fish and when I pulled him closer to shore, it was a pretty big shark," said VanderBent. She contacted FWC officials and shared a photo of the shark with them. "They said it looked too decomposed to do any tests," added VanderBent. VanderBent said her young daughter noticed the dead fish and others struggling to survive. Her daughter asked if they could help them. "When they're jumping, they're still struggling. She was hoping we could put them in our aquarium," said VanderBent. Homeowners have noticed fish kills in Bowlees Creek in Manatee County. Kelly Thomas runs a bait shop and gas station along U.S. 41. He said he noticed a drop in the number of customers. "What customers? People aren't coming. I mean nobody is going to buy gas in the middle of this. Nobody is going to buy shrimp and go fishing," said Kelly Thomas, business owner. On Friday, a viewer shared photos with ABC Action News, explaining that they found six dead sharks along with countless dead fish in the Yacht basin at Sara Bay Marina in Bradenton. The latest red tide update came out on August 17 . It stated red tide continues along Southwest Florida's coast. Fish kills have been reported in Pinellas, Manatee, Sarasota, Lee and Collier counties in the past week.